What we believe and what we do not believe has a great impact on what we do and fail to do. Hence, if we want to act responsibly, we should believe responsibly. However, do we have the kind of control over our beliefs that such responsibility for our beliefs seems to require? Do we have certain obligations to control or influence our beliefs on particular occasions? 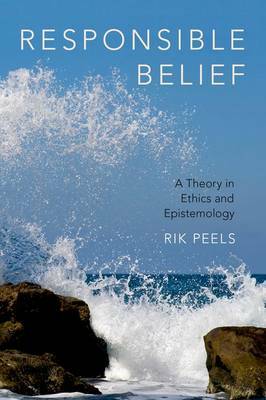 And do we sometimes believe responsibly despite violating such obligations, namely because we are excused by, say, indoctrination or ignorance?By answering each of these questions, Rik Peels provides a theory of what it is to believe responsibly. He argues that we lack control over our beliefs, but that we can nonetheless influence our beliefs by performing actions that make a difference to what we believe. We have a wide variety of moral, prudential, and epistemic obligations to perform such belief-influencing actions. We can be held responsible for our beliefs in virtue of such influence on our beliefs. Sometimes, we believe responsibly despite having violated such obligations, namely if we are excused, by force, ignorance, or luck. A careful consideration of these excuses teaches us, respectively, that responsible belief entails that we could have failed to have that belief, that responsible belief is in a specific sense radically subjective, and that responsible belief is compatible with its being a matter of luck that we hold that belief.